A tadpole is the first larval stage of a frog's life cycle. They are aquatic creatures that live on algae. The bullfrog (Rana catesbeiana) makes its home in the fresh waters of North America. They are nocturnal carnivorous predators, with green skin and brown spots, known for their baritone call. Bullfrog tadpoles can take anywhere from 14 months to two years to mature into an adult frog. In their tadpole state, they are nearly black or a very dark green with an arrowhead-shaped body and a small dorsal fin located just behind their heads. Go to your local fresh water pond, lake or creek in July to find bullfrog tadpoles. Aquarium centers may also sell bullfrog tadpoles. In clear water the tadpoles should be visible from the surface. Pour some water from the body of water into a temporary plastic aquarium. Once the aquarium is prepared, gently scoop up the tadpoles with a small mesh net and place them in the temporary plastic aquarium. Only collect as many tadpoles as the permanent bullfrog tadpoles' habitat can hold, that is, no more than two bullfrog tadpoles for every gallon of water. Do not collect tadpoles from conservation areas. Pour 2 to 3 inches of non-chlorinated water into the plastic container. You can decorate your tadpole habitat as desired with sticks, plants and rocks. Gently transfer tadpoles into the plastic container by using the small mesh net to scoop them out of the temporary plastic aquarium and into their new habitat. Feed bullfrog tadpoles twice a day every day with 2 tbsp. of fresh-boiled spinach. As an added diet supplement, two dried rabbit food pellets well-crushed by hand can also be fed to the tadpoles. For additional protein, hard-boiled egg yolks, flaked with a fork can be given to the tadpoles twice a week. Give the bullfrog tadpoles an hour to eat, then clean out food leftovers from the habitat and refill non-chlorinated water if needed. Watch your bullfrog tadpoles' transformation for the next two years. Once they have grown into frogs, release them back into the wild in the same location that you originally collected them. 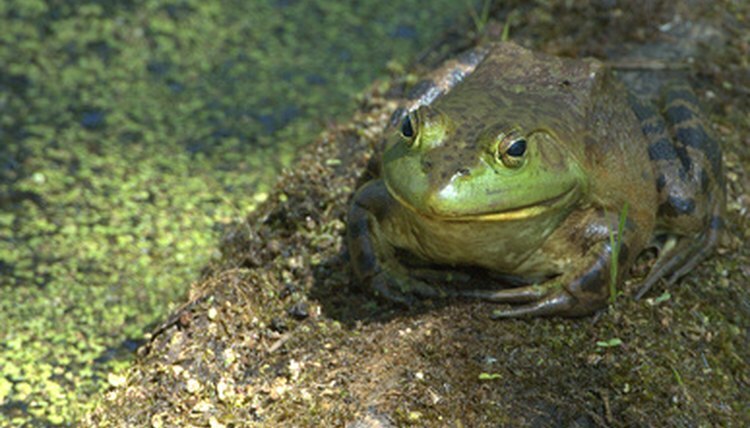 Bullfrogs can grow up to 8 inches in length, weigh up to 1.5 lbs. and require a carnivorous diet; as a result they are difficult to keep in captivity. Always use non-chlorinated water in your tadpoles&#039; habitat; chlorine will kill tadpoles and the algae that they eat. When cleaning and refilling the water in your tadpoles&#039; habitat, do not use soap or chemical cleanser. It will kill the tadpoles. Corinne Cooke began her writing career in 2007 after an extensive four-year research study into primate behavior. Cooke's project lead to her first published work in "Applied Animal Behaviour Science." She holds a Bachelor of Science in anthropology from the University of Toronto.